Philptown was the location and original name of the Chain of Ponds site and was named after the founding publican, Oliver Philp of the Morningstar Hotel. It was established around 1850. The township later changed its name to Chain of Ponds in 1864. It was initially a postal village, and played a stopover role in the difficult trek across the ranges. Of significant importance in the early days were its location, and the fact that it was used as a resting place. The roads were very poor indeed and travel through the area was extremely difficult, due to the hilly terrain and thick dense scrub. The Adelaide to Mannum coach service from the mid 1850’s used the Hamlet as one of four changing stations through the Adelaide hills on their trek to Mannum. In 1866 the Local South Australian Gazetteer described the Chain of Ponds as “having a fine spring flowing through it. The stream being imbedded in water cresses, which grow all year round!” The neighbourhood was said to be celebrated for its vineyards and fruit trees. Wine grapes were first planted in the Adelaide hills in the early 1840’s. 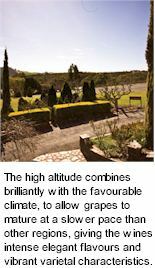 Situated east of Adelaide, the long and narrow Adelaide Hills region runs through the southern Mt. Lofty ranges. The high altitude combines brilliantly with the favourable climate, to allow grapes to mature at a slower pace than other regions, giving the wines intense elegant flavours and characteristics. Four thousand vines were initially planted, covering 9 varieties, consisting of 470 vines of each variety, which was further increased with an additional 150 acres planted in 1989. The first vintage being in 1988. The winery has more recently extended the vineyard boundaries to source fruit from a much broader area of the region, which has added further complexities and subtleties to the wines themselves. Chain of Ponds produces a wide range of products and varieties which are perfectly suited to this cool climate region. The white varietals include Sauvignon Blanc, Pinot Grigio, Semillon and Chardonnay. The reds include popular Australian varieties: Shiraz and Cabernet Sauvignon, as well as emerging and exciting varieties for the region: Pinot Noir, Sangiovese, Barbera and Nebbiolo. Much of the fruit grown to Chain of Ponds has been a component of the most memorable Penfolds vintages, the finest parcels are set aside and vinified under the estate's own label. The vines are husbanded by one of the regions eminent growers, planted to salubrious soils and trained to Scott Henry trellis.